Dear Ugandans, I think we need to be very careful. We want freedom, and all the possible Human Rights, but I don't think our peasants benefit from the current strategies of Dr. Kiiza Besigye. Mr. Besigye is arrested every time he comes out to meet the common people. What happens is that the security personnel end up following him up, holding him briefly, and eventually release him. What happens to the common people? They are dumped inot cells and they end up decaying there. Their properties are destroyed, and Besigye does not pick the bill. They lose income. Yesterday, many sustained injuries, I don't know how much Besigye has done to see these people's families better. 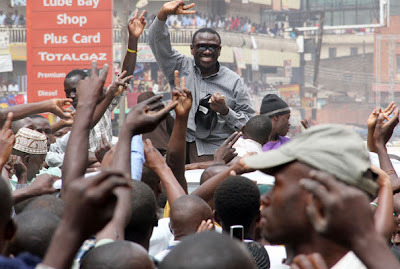 By Vision Reporter Two people sustained bullet wounds during the chaotic arrest of Forum for Democratic Change (FDC) president, Kizza Besigye along Namirembe road on Thursday. 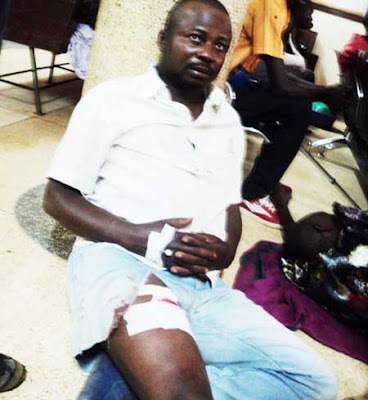 The victims who were not identified by press time were shot in the legs by stray bullets. One of the victims is a bodaboda cyclist within the city, witnesses say. However, it is not known yet whether more people were hurt during the afternoon fracas. The FDC leader entered the city after beating security that was beefed around his home in Kasangati Thursday morning. The arrest turned chaotic with cops shooting in the air and releasing tear gas canisters to wade off 'opposition sympathisers' who were moving with Besigye. Traders who operate in several arcades downtown Kampala locked up their shops for fear of looters taking advantage of the chaos and making away with their merchandise. Besigye was later arrested and whisked off to Kampala Central Police Station. The Thursday incident almost played out like Monday's, where police clashed with some members, particularly of the opposition, including Besigye. Police early Monday deployed at the homes of Besigye, Kampala Lord Mayor Erias Lukwago and Kampala central MP, Mohammed Nsereko, to block them from going to the city. The security operatives had been tipped on the intentions of the highly influential leaders. The FDC president had planned to hold a rally at the Constitutional Square in the city centre. Mayor Lukwago had his sights on touring the wiped-out New Taxi park, from where, it is said, he would meet some of his supporters. Chaos The city has been host to dramatic scenes since the start of this week where police and opposition leaders have been at loggerheads. Monday saw a number of arrests, where Besigye and Lukwago featured highly in the mix. Lukwago was arrested, released then rearrested that day. Some people along the streets are now working, uncertain of what would happen next. "I fear being in the city now because of the teargas. But since i have to work and earn some money, i cannot just stay seated at home doing nothing," a hawker in the city said. Police prior to the Monday chaotic episodes warned against staging any kind of rallies in the build-up of the jubilee festivities slated for next week, October 9.